We don’t go there much anymore, but back in the day we used to frequent a little Vietnamese restaurant in our local area. Today, on AT’s first day home from work I thought it fitting to revisit one of our past haunts and sample an old favourite. We felt like truant teenagers, pigging out on Vermicelli Noodle Salad when we should be at home packing boxes. 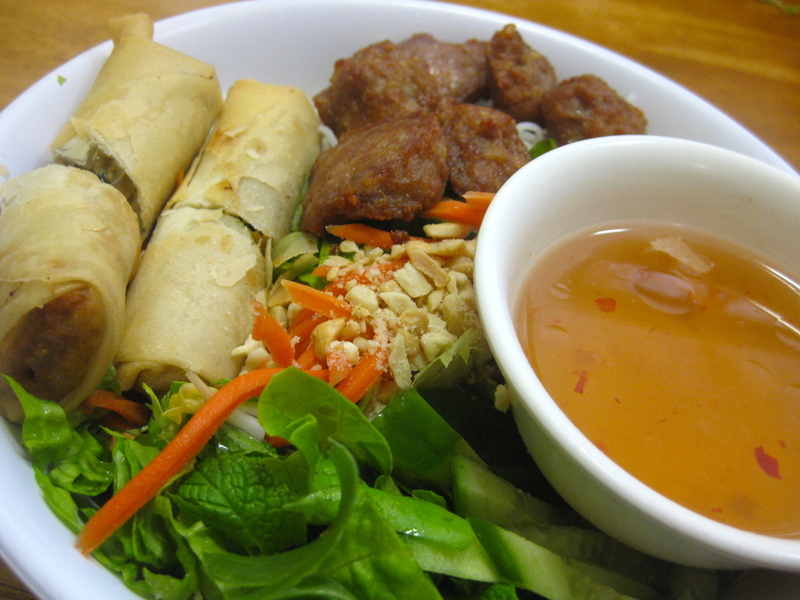 I used to prefer the stir fried beef, but then moved onto the half spring roll – half pork meatball variety. Imagine the vibrant, fresh flavours of cold rice vermicelli mixed with mint, pickled carrot, cucumber, butter lettuce, crushed roasted peanuts all dressed with obscene amounts of the ubiquitous nuoc cham. I am sure this won’t be the last time I have this tasty treat, as I am sure they will have Vietnamese diners in the UK.